If you’re looking for a heavy-duty indoor cycling trainer, the BodyCraft SPT-Mag magnetic cycle fits perfectly to the profile. 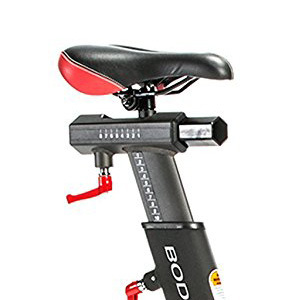 Although it does not include a fitness meter and does not have SPD pedals, it is a commercial grade bike designed to support all spin workouts. It excels in micro-adjustability and, as opposed to the BodyCraft SPX model, it features a magnetic resistance system. Since it’s a commercial grade exercise bike, its frame is made of heavy-duty steel tubing. In fact, most parts in its construction are steel-made, with the exception of several covers. The main frame features a corrosion-resistant and scratch-resistant paint finish; the colors used are black for the main body, grey for the upright bars of the seat and handlebar, while the horizontal adjustment sliders of the seat and handlebar have a chrome finish. 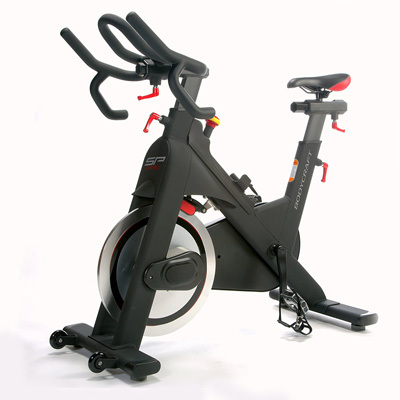 The BodyCraft SPT-Mag indoor cycling bike offers an extremely sturdy construction and exceptional stability. Not only that its center of gravity is situated pretty low, its base bars are both equipped with adjustable stabilizers, each stabilizer featuring a large rubber cap. Plus, the whole bike weighs approx. 116 lbs (~52.6 kg), which is more than twice the weight of the average road bike, and this weight also plays a very important role in its overall stability. So, as a small conclusion here, even if you’re close to the bike’s maximum weight capacity, it still shouldn’t wobble or move when you exercise, even if you undertake a more demanding spin workout. On the other hand, moving the bike shouldn’t be too difficult; its front base bar is equipped with two large wheels which facilitate its relocation. Speaking of weight capacity, the BodyCraft SPT-Mag bike can support users up to 350 lbs (~159 kg), which is quite impressive for a spin bike. Other models labeled as commercial grade bikes, such as the ASUNA Sabre from Sunny Health & Fitness, for example, only have a 285 lbs weight capacity. Compared to other cardio training machines, such as treadmills or ellipticals, this exercise bike isn’t large. It won’t take too much usage space. With the frame completely assembled it takes 42″L x 24″W (107 x 61 cm) of floor space. It’s recommended, though, to maintain at least two feet of clearance all around it for safe operation, entry, and exit. Last but not least, the BodyCraft SPT-Mag bike has quite an aesthetic, professional-looking aspect. This can serve as a motivation factor. It’s definitely not a cheaply made bike; differently put, it’s a rock-solid item of fitness equipment. 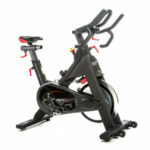 The SPT-Mag indoor cycling trainer from BodyCraft Fitness is equipped with a 4-way adjustable seat. Its upright post is ovalized, while the horizontal slider is hexagonal. Due to these shapes, it is almost impossible for the seat to turn sideways. The seat’s upright bar and horizontal slider offer quite many adjustment positions, with increments of approx. half an inch. Differently put, the bike can accommodate users between 5’0″ and 6’5″ (152 – 196 cm) with no problem. The saddle is an elastomer cushioned model, featuring a longitudinal groove to promote a healthy blood circulation during seated workouts. It offers optimal comfort, but overall, it’s not a saddle built for comfort. 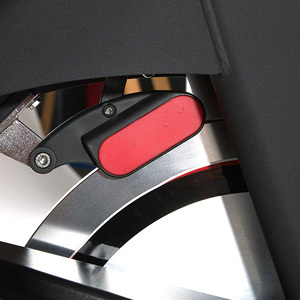 It’s a slim spin seat, and almost any new user to spinning will find it uncomfortable at first. However, its comfort can always be improved by a gel cover. Also, the connection system to the slider is standard; thus, compatible models are widely available. Compared to other indoor cycling bikes made for spinning, such as the Fitness Reality X-Class 710 or the Horizon Elite IC7, this BodyCraft exercise bike offers a more versatile handlebar. Not only that its handlebar integrates a middle loop aero bar, it also has two lateral drop-down grips, which multiplies the workout postures that you can adopt during your workouts. Just as the seat, the bike’s handlebar is 4-way adjustable (up, down, forward, and backward). It’s completely covered by a layer of high-density foam, in order to provide a non-slip, secure grip. Its horizontal slider is also hexagonal, while its vertical post is ovalized. Both the seat and the handlebar are very easy to adjust. They’re equipped with large lock levers, easy to grip and turn. Therefore, adjusting the bike to your own size shouldn’t take more than a minute. 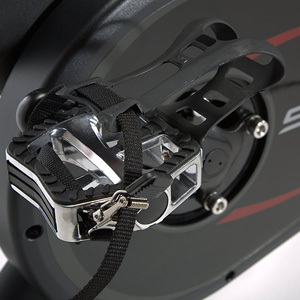 As we’ve mentioned above, the BodyCraft SPT-Mag Club Group Cycle is equipped with an eddy current (magnetic) resistance system, which consists of a magnetic brake placed over the flywheel and connected to the adjustment dial on top of the main bar of the frame. The brake is not motorized, so the bike doesn’t require a power source in order to generate resistance. It’s a manual magnetic brake, and as you turn the dial clockwise, the magnets in the brake’s construction will come closer to the flywheel increasing the resistance. The brake knob also has the function of an emergency brake. By pressing it down the brake applies full contact to the flywheel instantly stopping it if it’s necessary. And this function may be necessary if you repeatedly alternate normal pedaling sessions with backward pedaling sessions. The brake doesn’t have pre-determined resistance settings. You simply “tighten” it until you obtain the resistance that you feel adequate for your workout. The first aspect to mention here is that the BodyCraft SPT-Mag bike is equipped with a belt drive system. This feature comes with two main advantages. One, the pedaling motion is extremely quiet, almost silent; second, the belt doesn’t require any lubrication, so the bike’s transmission part is basically maintenance-free. The integrated flywheel is bi-directional. In other words, it gives you the possibility to pedal backward as well, with the same resistance given by the selected level. The bike doesn’t offer the possibility to coast, though. The flywheel weight isn’t specified. However, it’s a mid-range flywheel, with a weight somewhere between 30-40 lbs. It’s perimeter-weighted and delivers a very smooth motion and a consistent momentum, perfect for spin workouts of all sorts. Just like any other spin bikes, the BodyCraft SPT-Mag bike is equipped with an extremely sturdy, 3-piece crankset. Even if you’re close to the maximum weight capacity you should be able to pedal while standing up with no problem. The bike’s Q-Factor isn’t the narrowest, but at 175 mm it’s still narrow enough to eliminate any lateral stress on the ankle and knees during your workouts. Last but not least, a heavy-duty, metallic alloy set of pedals is included with the bike. They’re dual-sided, featuring toe cages with straps on one side, but you can also use them on the other side without the cages. They do not have SPD clips for spin shoes. However, they’re standard pedals featuring 9/16 threads, which means you can easily find replacements for them. Although most of the bike is pre-assembled, some parts do require assembly. You will have to attach the base bars, the seat upright post, the saddle, the handlebar upright post, the handlebar, and the pedals. This shouldn’t take longer than 20-30 minutes, though. The included manual will guide you step-by-step through the assembly process. All the instructions are pretty clear and straightforward. Also, all the tools required for the assembly are included with the bike. Since it’s a belt drive bike, the transmission of the BodyCraft SPT-Mag doesn’t require any lubrication or maintenance. In fact, the only maintenance that is required for this bike is keeping it clean, and periodically check if all the parts are well-tightened in their places. The BodyCraft SPT-Mag bike is a commercial grade indoor cycling trainer, featuring a frictionless magnetic resistance system and a belt drive. 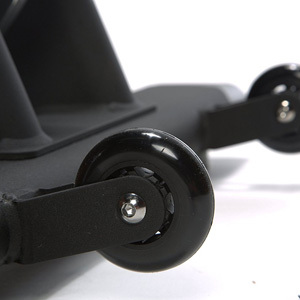 It has an extremely sturdy frame and an impressive weight capacity of 350 lbs. It also excels in micro-adjustability, with a 4-way adjustable seat and handlebar. It’s a rock-solid bike, perfect for all kinds of spin workouts, for light to intense cardio training, weight loss, endurance gain, and intervals. Although it doesn’t include a fitness meter and it’s not exactly an affordable bike, it definitely offers outstanding value for the price. Yes. The included pedals have standard 9/16″ threads. Any type of 9/16″ SPD pedals should be compatible with this bike. What’s the weight of the flywheel? Several sources say 46 lbs (20.8 kg). However, it shouldn’t matter that much since the bike has a magnetic resistance system. That’s probably the main reason the official BodyCraft website doesn’t mention the flywheel weight for this bike.